The holidays are nigh, and with them, the annual pilgrimages made by millions back to their hometowns. For some, this is an opportunity to bask in the warm glow that radiates from the memories of their youth; for others, it's a reminder of the lives they were happy to leave behind. Homesickened is a game about going back home that transforms the former into the latter, and reveals the rotting wood that often lies beneath the veneer of nostalgia: the realization that things were never actually as good as we remembered. The game (which displays a fictional copyright date of 1986) opens with the sound of an old computer booting up, and the only audio you hear throughout is the distinctive whirr intimately familiar to anyone who used a PC in the 1980s. Maybe it will even conjure a picture of it in your mind: the desk it used to sit on, the chair where you huddled. It's a detail that hints at the strange sensory wormholes that can be opened to different times in our lives by a scent, a sound, an old knickknack unearthed from a drawer. 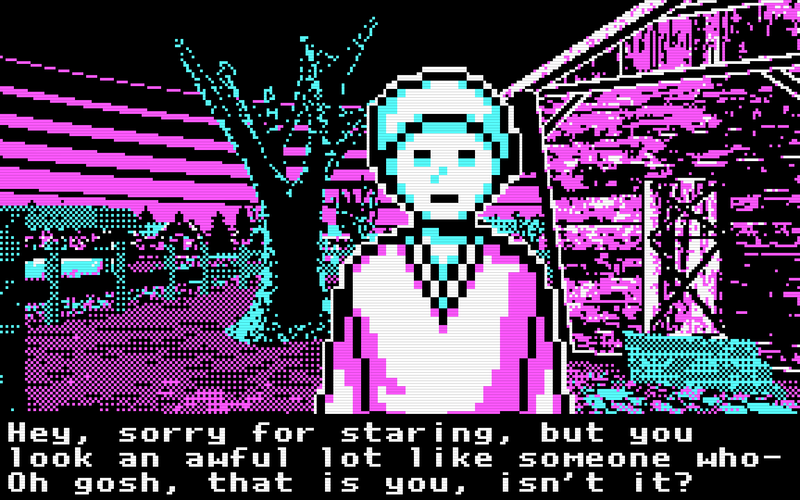 You begin by walking down a path towards a small town—your town—all of it rendered in the blocky purple and cyan of CGA graphics. In case you'd forgotten, those graphics were pretty janky, and often so were the controls that navigated you around their four-color worlds. Moving around in the game is not what I would call "comfortable," and neither are the conversations you have with former friends around town. One actually claims not to recognize you because you've changed so little, which is a strange but effective burn in a game that looks at the past through such skeptical eyes. While there's not a lot to do in the game, Homesickened is still refreshing, if only because it doesn't gloss over the awkwardness of the era it simulates. There's a pretty substantial market for nostalgia in the world of video games these days, as the children of the '80s march into their 30s and gaze back at the virtual pastimes of their youth with a rosy and sometimes distorted idealism. I don't know how many '80s babies have actually gone back as adults to play the computer games that they used to fire up on their old Apple IIs, but it can be jarring and dissonant as it is in Homesickened. Much like returning to your hometown after years away—or breaking open the amber any cherished memory—it's easy to discover that things don't look the same through the lens of the present, and that looking forward is ultimately far more likely to satisfy than looking back. Developed by Snapman, Homesickened is downloadable for free on Linux, Mac and PC.